The links contained within this article are affiliate links, which means that at no cost to you I make make a commission if you click through and make a purchase. You’ve captured the perfect picture. You’ve composed the perfect caption. You’ve discovered the best time to post. Now, what hashtags should you use to make sure your perfect post gets seen by the most eyes? 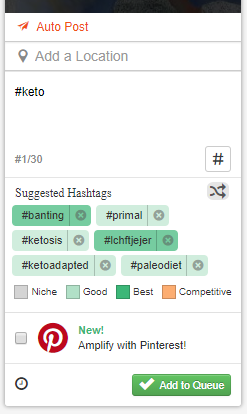 Finding Hashtags used to be a CHORE but now it’s a cinch with Tailwind’s Hashtag Finder Tool! This feature makes it extremely easy to find the best hashtags for each Instagram post. Simply type in one hashtag and Tailwind will suggest related hashtags. Even better, they use a color-coordinating system to easily tell you which hashtags will perform BEST. And, my posts are now getting more impressions, likes, and comments! Less time for more engagement? Sign me up! Tailwind is the ONLY tool that I trust for my Instagram and Pinterest marketing. More hashtags aren’t always better, and choosing hashtags faster doesn’t automatically make them better, either. But Tailwind’s Hashtag Finder does all the work for you, from suggesting related hashtags while you type, to highlighting the hashtags that will help your posts reach more people, and finally to automatically posting your Instagram posts so you don’t have to be on your phone 24/7. Tailwind is an approved Instagram and Pinterest Partner, making them my trusted, go-to source, because their methods are 100% approved by Instagram and Pinterest. This awesome tool even counts the number of hashtags you’ve used in your caption so you don’t have to, and so you don’t go over the hashtag limit! Curious about the strategy behind using hashtags? Check out this in-depth article. And that is HUGE for bloggers who depend on the social media algorithms to be seen, engaged with, generate traffic, and ultimately make money. But Tailwind wasn’t done when they finished the Hashtag Finder. They wanted to make our Instagram marketing even easier, and so they created Hashtag Lists. Once you’ve found a great combo of Hashtags, you can save them to a list, save it with a name that will let you remember what types of hashtags are in it, and then insert those hashtags into any future posts with a few clicks, not 30. Tailwind is constantly developing new, innovative, and time-saving tools for bloggers and businesses, and their Hashtag Finder Tool is the newest and best of the bunch. Get started to today & make your marketing easier! This post may contain affiliate links. See my disclsoures for more information.